We all know and love Cafe du Monde, and their secret frying recipe is what has kept their beignets a nationally acclaimed phenomenon for decades. But did you know that those beignets can be brought to your doorstep? That’s right, Cafe du Monde actually has a beignet food truck to bring you fresh hot beignets anywhere you want ‘em – if only we could buy them to make our breakfast every day. 3. Salt & Light Pastry Co. Chef Ruby Bloch is an impressive independent chef. In the span of her twenties, she’s been named a Chef to Watch, became a Zagat 30 Under 30, and has even been featured on the Food Network. Now she creates beautiful pastries that are both simplistic and complex in presentation and taste. Elysian Seafood has been a long time chef partner with My House Social, we’ve loved watching them grow along with us. Their work with St. Roch market catapulted them into the mainstream, where people travel from all over the world to try their fresh oysters and seafood. 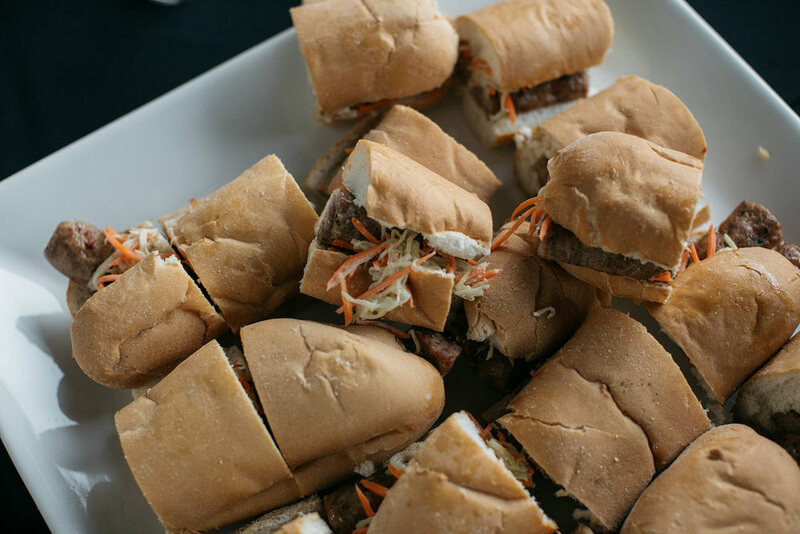 At IDSA, they brought an awesome spread of PoBoys from Roast Beef to Alligator Sausage. Diva Dawg is another long standing chef partner at My House Social, and we love how her vibrant personality shows in all of the food she prepares. She’s been featured in publications like Cosmopolitan, Essence, and was even a member of the Tory Burch Foundation. Neesa is a fan favorite of My House Social clients, and honestly, how can anyone not be a fan of snoballs? Neesa ventured back to New Orleans after starting Imperial Woodpecker in New York. You can still find her stand on Magazine Street until October 14th, and you can find her at events, working private parties with us. Mangé is a new chef partner we’ve made this year, and we’ve been so lucky to have them partner with us on a multitude of events. Chef Marlon is actually a celebrity chef having worked with KISS and Christina Aguilera before coming to making roots in New Orleans. He’s since opened Cru and Poulet along with his catering business this year, and his growth has been well-received by the community. Check out more of what we can bring to your corporate, social, or private event.